I've been chatting to a few people about my Rogue Planet experiments/trials, but have found describing the game (given it being so different) isn't easy. So, in an effort to illustrate how various mechanisms work, I've recreated a scene from our recent games and applied a dash of artistic license. Who knows, you might be enticed to give the game a try - I hope you do and I think you'll find something very different indeed. Quite deliberately I've not reflected all the game's detail in the following account. Why? Well what you're seeing is the application Brent Spivey's intellectual property and if you'd like to experiment and play the game, do him (and ultimately us all) a favour and just purchase it - in the scheme of things, it's hardly a huge outlay; most of my workmates would spend more on a given day on coffee and lunch! You get an ebook, various summary guides, house rules and more for one low price via Wargame Vault. It's a great deal. During this 'report' I'll enhance (?) the gameplay with narrative in red type. Again, I won't fully detail all the game's mechanics, instead, I'll provide some insight into how things work. If during the Battle Report you find yourself wanting to know more, I really recommend you purchase Brent's game. Finally, I've reached out to Brent and asked him to help me understand the game better. If he points out something out-of-kilter with his design, I'm sure he'll let me know and I'll try and update this page. 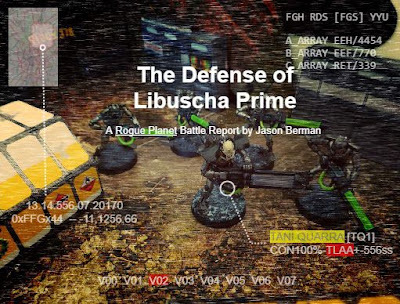 During the early evening, Libuscha Prime's garrison was alerted to a xeno incursion. 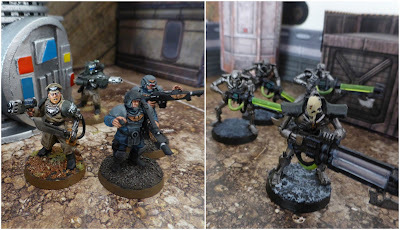 Captain Stonnet's response unit was deployed and fought a series of running battles with a group of Necron Tani raiders, harvesting organic materials for their own nefarious reasons. The ensuing battles that followed were brutal. Despite Stonnet's local knowledge and strength of numbers, the resilience and tenacity of the Necron have made for a desperate situation. 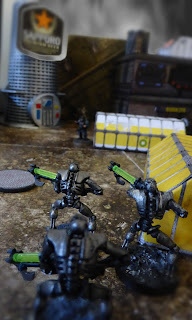 We join Captain Stonnet, accompanied by Troopers Thardson, Grezal and Matte, a heavy weapon specialist, as they attempt to intercept three Tani Gilli Warriors led by a single Tani Quarra Immortal. 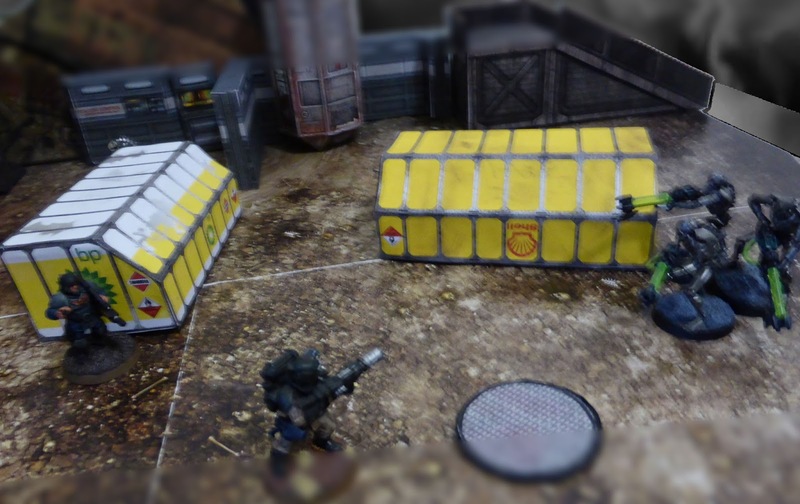 Rogue Planet provides a Credit (point) system to assist with the unit and scenario design and balancing. Unit design and costing are very straight-forward - it's basically a menu system e.g., to increase the melee skill of a unit from a rating of 5 to 6 is a simply a difference of 6 Credits. The relative strength of the Forces in this battle is presently tipped in the favour of the Humans by about 30% (135:194 Credits by my reckoning). Rather than playing the numbers, I've designed Forces that tie into the story-line and reflect my models e.g., the Tani have Axe, not Blade bayonets. Additionally, each Force is allocated an Energy Pool, which is dependent upon the Force's composition e.g., troops allocated Power Armour confer additional Energy relative to those troops with more mundane (and cheaper) armours. The Energy Pool is a core game mechanic and you'll get some appreciation of its application by reading the Battle Report proper. In this Battle, Human's have an Energy Pool of 4 and the Tani's Pool is 3 - this wasn't their starting Pool's rather what's remaining when we join the action. I've used the 🗲 icon to highlight Energy Pool-related commentary. Two things worth pointing out related to ARM/armour ratings. There are four 'levels' being Light, Medium, Heavy and Group. As you'd imagine, a Medium-rated Unit (like the Tani Quarra) can take more punishment than a Light, and less than a Heavy-rated Unit. "Group" is something altogether different - think of it like Hit Points and it can also be used to designate a squad. More about that later. The game requires the designation of a Leader in each Force. Each Leader has access to additional heroic traits/skills, some of which are described in the following account. The game type being played is a (slightly modified) Patrol which negates the Leaders usual Resilient trait and excludes them from using special Leader advantages or abilities called Pawns. Rogue Planet also includes a clever scenario generation system - I'm looking forward to trialling the same in due course and, if there's interest, I'll write up a future Battle Report relaying our experiences in that regard as well. 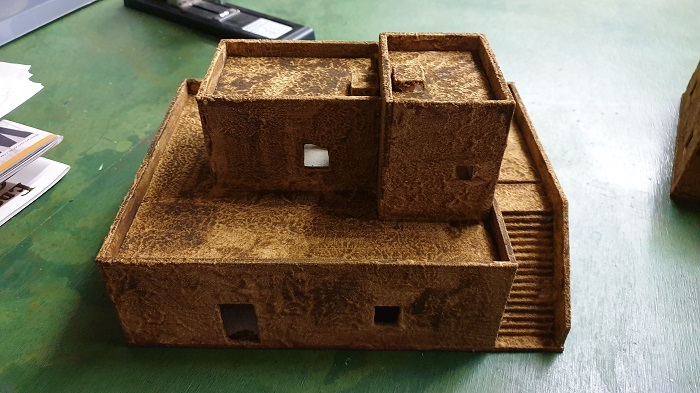 This scenario was played on a tiny 30-by-60cm map - unheard of using 28mm miniatures! The Sapporo Beer Factory is in lock-down and cannot be accessed. None of the terrain is destructible. One thing you'll quickly appreciate is how Rogue Planet's turn structure is hugely different from many of the mainstream war games... the best way to appreciate the difference is to play the game, but failing that I hope I've provided a sense of how the game flows. Each Turn starts with the generation of Action Points which dictate what can be performed, like moving and firing weapons. During a usual game's opening Turn, neither party is normally able to choose 3 Action Points - both would roll instead. As we're joining a game underway, each player has the option of rolling for between 1-6 or choosing 3 Action Points. 🎲Both the Humans and Tani roll 2d6 (1d6 for the 'team' +1d6 on account of the hero still being in play) retaining their highest scores. Both Forces score a 4, and because the Humans lost the initiative previous turn, they are given the choice as to who will begin this Turn. The Humans allocate that 'privilege' to the Tani. Captain Stonnet's local knowledge served him well: given the Tani's approach, he identified an ideal ambush point next to Block 378. "Keep your wits about you men," whispered Stonnet to his Team, "and make these xeno scum pay for our blood." The Tani have 4 Action Points available to spend and commence by moving the Tani Quarra due North in an attempt to reach the high ground afforded by accessing Block 378's roof. "Ahhh... so much life!" exhales the Tani Quarra stalking cautiously towards Block 378. Movement in Rogue Planet is performed in straight-lines and isn't restricted by distance, only by terrain i.e. if you wanted to move from one end of the board to the other, and nothing blocked your path, you can. Yep, you read right: movement isn't measured in Rogue Planet. Spying Thardson from its new vantage point, the Tani Quarra opens fire with its Particle Accelerator Cannon. Opening fire costs the Tani their second Action Point, reducing their pool of 3 down to 2. Unless especially equipped, Units are only able to target the closest enemy. Rogue Planet uses a Counter-Action mechanism which allows players to interrupt (?) their opponents Turn and perform things like dodges, interceptions and return-fire. To do so also requires/costs Áction Points. Thardson declared a Dodge Counter-Action (the Humans now have 3 Action Points remaining). This particular action introduces an additional Rogue Die to the Quarra's Skill Check roll. The Quarra performs a Skill Check with 2d6 along with a Rogue Die (d6) which are used to determine (1) whether Thardson's dodge was successful, (2) the relative effectiveness of the attack and (3) the outcomes (unit disposition etc) either way. 🎲The Tani rolls a 4, 3 (Skill Check) and 1 (Rogue). If the Rogue Die had matched either of the Skill scores (e.g., the Tani had rolled a 3 on the Rogue Die) then the Ranged Attack would have been dodged and negated. In this instance the Rogue Die didn't match, so the Ranged Attack is resolved as per usual. Determining the outcome of a Skill Check, like a Ranged Attack, involves summing 2d6, adding/subtracting modifiers and comparing the result to two (consistent) success targets. I'll put a bit of detail into this first Skill Check and a little less in later Skill Checks. The Ranged Attacker's RAT is compared to the Defenders DEF: The Quarra's RAT = 5 and Thardson's DEF = 4, yield a +1 to the Quarra's Skill Check. Additionally, the Quarra's weapon provides an additional +1 modifier vs Light Armour. That's a +2 modifier to the Quarra's roll. The Tani's end Skill Roll was a (4 & 3 + 2) modified 9. ...and all non-heroic Units are usually destroyed by a single point of damage. However not all hope is lost for Thardson. The Force's Energy Pool can be applied/spent to offset the damage. 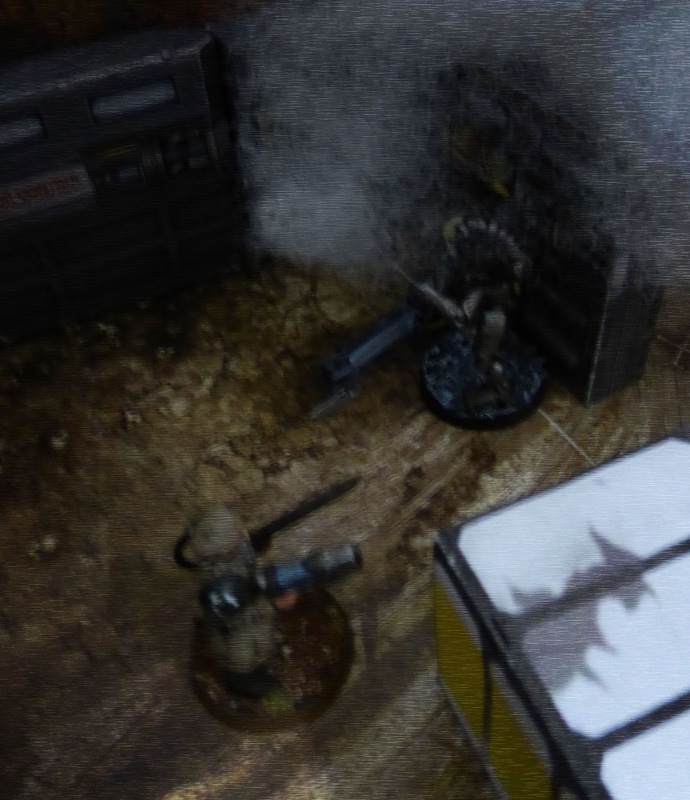 ...but that was all - Thardson combat pack was destroyed but he's still in the fight. Secondly, a Partially Successful Skill Check allows the Opponent to make a (free but somewhat limited) Move with a single model. 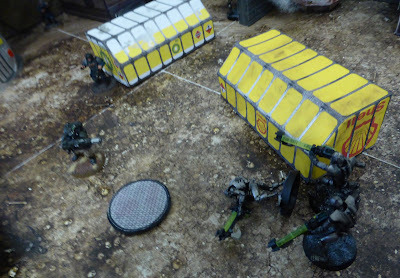 Seizing the moment, Thardson collects himself and moves to the South, taking cover on the opposite side of the container from the Tani and staying out of sight from the remaining Tani force. The Tani now have 2 Action Points remaining and the Humans have 3. Action Points can't be 'stored' so the Tani might as well use them! Heroes have access to a special Command Action. At a cost of 1 Action Point, they can direct multiple Units to perform a (basic) Move. As the Gilli are designated a Group, so the point is mute, but should they have been three individual Units, all three could have been moved at the cost of 1 Point - a very handy ability indeed! Thardson's position is such that he's now obscuring Line of Sight (LoS) between the Gilli and the rest of his Squad. He has an opportunity to perform an Intercept or Op Fire Counter-Action (at a cost of 1 Action Point) but declines the opportunity to do so. Using the last of their Turn's Action Points, the Gilli perform a Ranged Attack on the nearest Human in range - unless a Unit is equipped with specific items/gear, which comes at an additional Point cost, Units are limited to attacking solely the nearest enemy. ... and open fire on Thardson with their combined Cannons!!! As the 3 Gilli Tani are designated a "Group" the three models have to remain close to one another and act as if they've got 3 hit points - otherwise they're largely treated a typical unit with regards to Skill Checks i.e. the number of Gilli in the Group has no bearing on the number of dice rolled during Skill Checks. 🎲They perform a RAT vs DEF Skill Check targeting Thardson. 2d6 are rolled, yielding a 4 and 5 (=9). The net difference between the Gilli's RAT and Thardson's DEF = +1, to which the soft Carbine vs Light Armour buff is added, yielding a result of 11. A 10+ equates to a Total Success. A Total Success by a ranged attack against a Lightly armoured target results in damage equal to the absolute difference between RAT and DEF i.e. 1 Point in this instance. 🗲Again the Humans expend another Energy Point to keep Thardson alive. The Human Energy Pool now stands at 2 Energy Points. Unbelievably Thardson stands his ground and shrugs off the barrage that would have downed any lesser man. With no more Action Points available to the Tani, the Humans are now able to expend any of their remaining Action Points should they wish to do so. Indeed they do! So with 3 Action Points available (if only they had four! ), coupled with no threat of a Counter-Action, the Humans go on the offensive. An important feature of this juncture is that the Tani cannot declare Counter-Actions: firstly because they haven't got any Action Points left but also, as they were the initial activating force, they're prevented from doing so anyway. Given the situation, Mattes moves up closer to the Gilli at a cost of 1 Action Point - leaving 2 Action Points remaining. Matte could now open fire on the Gilli right now (at the cost of an additional Action Point) but need not as the Gilli cannot perform any Counter-Actions this Turn. Instead, over to Captain Stonnet. At a cost of 1 Action Point, the Captain takes the opportunity to bowl directly into his alien adversary. Charging in Rogue Planet isn't shorthand for initiating melee, rather it's as the name suggests: smashing into your target in an attempt to knock them senseless or worse! ...slamming into with the fury of a Bull Grume Beast at the height of matting seasons i.e. a lot more fury than a Grume Beast would typically manage. Now not every charge ends up as planned. It is quite possible that the Charger could be on the receiving end of a very big headache! Rogue Planet includes rules for addressing physics and effects including Collisions. Collision outcomes are determined firstly by a roll-off between the two parties, giving an advantage to the initiator (who get's to roll twice and keep their best) and more heavily armoured party. 🎲Stonnet rolls a 1 and 4 and the Tani a 2. The absolute difference between the two results is 2 and Stonnet was the winner. As a result, 2 points of damage are inflicted upon the Tani and subjected to a Stagger effect. 🗲 Firstly 2 points of damage. Heroes/Leaders are normally awarded the Resilient trait; however during a Patrol game that trait is negated. Without thinking twice the Tani expends two points from their Energy Pool to keep the Tani Quarra in play. That reduces the Tani's Energy Pool from 3 to 1 Point. 🎲Secondly, the Tani is Staggered. To determine the Stagger's effect you roll 2d6 which then yields either a Standard, Impressive, Most Impressive or even Epic FX outcome. In this instance, the FX yielded a Standard outcome which isn't as underwhelming as you might think. One of the few measurements made during the game is to apply FX outcomes. A Standard Stagger results in the Charging player moving the Target back the width of 3 fingers away from their point of contact. ...into a nearby reactor panel, causing a bellowing cloud of smoke to erupt. I put that bit in for dramatics - under the standard rules, staggering into a wall doesn't result in collision damage... but there's certainly scope for the same using the rules for throwing etc - yes, some Units can throw enemies around the battlefield. The Human's now have but one Action Point remaining for the Turn. 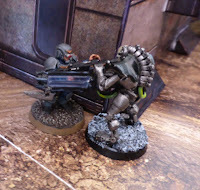 There are a few choices to be had, for example, Trooper Grezal is yet to join the fray, but given Matte's proximity to the Gilli, and given he's armed with a Plasma Splitter - basically it boils down to a case of use it or likely lose it. 🎲🗲A RAT vs DEF Skill Check is made with a soft buff modifier, due to the combined effects of Matte's assault weapon buffs and the cover afforded to the Gilli by the nearby Container. A modified Skill Roll yields a Partial Success, causing the Group a single point of damage. The Tani player decides to retain their remaining point of Energy - that Point might be required next round if things don't go their way. As such one of the Gilli models is removed from play, reducing their combined strength by a third. Damage to Groups in Rogue Planet is simply represented by removing the Group's models. they take advantage of the chaos of battle. ... melting one into a heap of slag whilst the remaining Gilli press home their advance, racing past Matte to engage Thardson directly. * Note: I think we made a mistake here: the Gilli weren't entitled to engage Thardson, rather they should have engaged Matte as he was the closest enemy within LoS. Oopps! The Turn finished with the remaining two Gilli moving directly North into base-to-base contact with Thardson. The Quarra heads North and opens fire on the Humans and the Gilli head West. Thardson evades the Quarra's initial volley and heads South into cover due South, only to be then fired upon by the flanking Gilli. 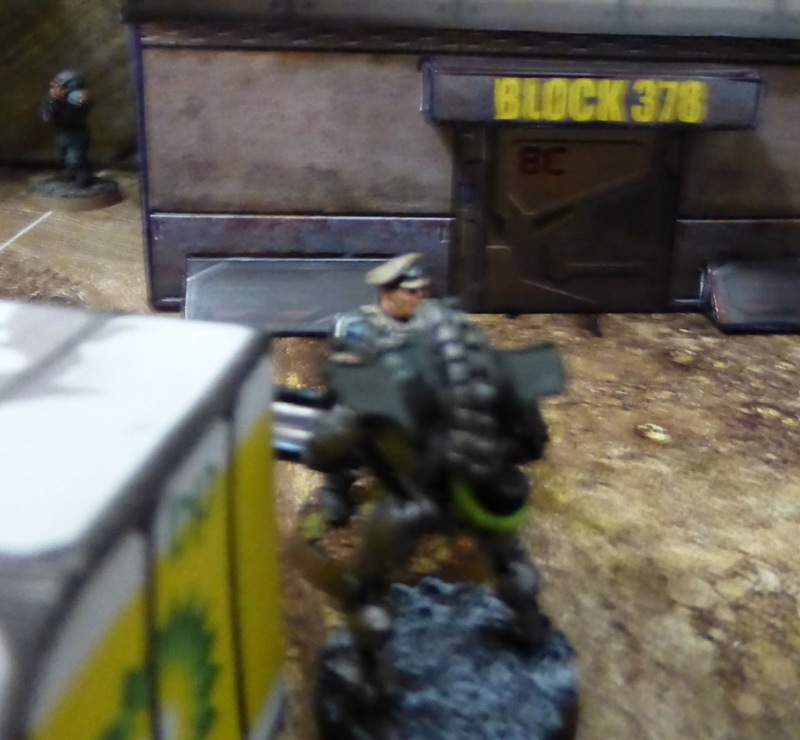 Captain Stonnet charges into the Quarra, knocking it back into a nearby wall. Unit-wise, the only casualties were a single Gilli thanks to Matte's fire and only Trooper Grezal is yet to be activated and remains standing at the Northern edge of the battlefield, waiting for his opportunity to contribute to the battle. 🗲The engagement has cost both Forces in Energy, however: the Human's Energy Pool was depleted from 4 to 2 Energy Points whilst the Gilli expended 2 Energy leaving their Pool with just 1 Energy Point remaining. How was all the above action achieved? A single measurement was performed: moving the Quarra a distance of about 3 inches or 6 centimetres subsequent to Captain Stonnet's successful charge. 🎲6 discrete, deliberate Unit movements were made: the Quarra moved once, the (group of) Gilli twice, and Thardson, Matte and Captain Stonnet all moved once apiece. When it comes to dice rolling, there were collectively about 8 rolls made. For example, early on Thardson waited for the Quarra to open fire then attempted a Dodge. Alternately one of the Human's could have attempted either an Intercept or Opportunity Fire Counter-Action. 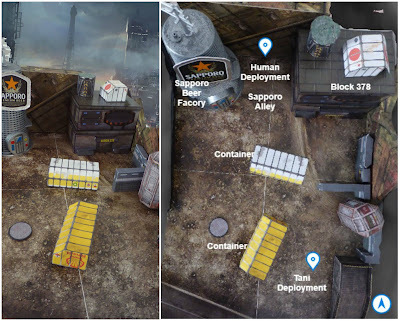 Also, the fact that Thardson was hugging the Western side of the Container, thereby preventing the Quarra from establishing a line of sight also meant he inadvertently blocked his squad's line of sight to Gilli in the West. That was telling: otherwise, Matte might have saved an Action Point and instead fired twice into the Gilli. The Tani Quarra might have also played things differently. Leaders can expend 3 consecutive Action Points so the Quarra might have moved North, then North-West charging the Humans and followed up with a melee attack. 🎲Each Turn begins with both Forces generating their Action Points. Again both sides opt to roll, with the Humans scoring a 2 and 1 (Captain Hindsight says "Always elect the default 3 Action Points") and the Tani a whopping 6 and 3. 6 beats 2 so the Tani have the option of either beginning or forcing the Human's to start. Brimming with confidence, the Tani take the initiative. 🎲At a cost of 1 Action Point, the Quarra resolves a Ranged Attack on the good Captain, which yields a modified 5 i.e. a Complete Failure. Complete Failures award a single move to the opponent and in the absence of a specific failure penalty, then provide for a second move. Additionally, when a ranged attack fails against a hero, the hero's special Combat Stunts rule comes into effect. Combat Stunts reflect the hero's ability to do totally heroic things like dodging bullets, flipping over enemies, bouncing off walls etc. 🎲Captain Stonnet's Impressive Combat Stunt result roll allows him to move 2 FX measures and then both Grezal and Matte are also moved. ...however again Captain Stonnet, a veteran of a thousand battles, spins away, dashing into cover and eluding the Quarra. Seizing upon the opportunity, Grezal moves South to the corner of Block 378 and Matte moves East, both lining up the Quarra in their sights. The Tani are now in a bind: Whilst they still have 5 Activation Points available, should the Quarra activate, the Humans have the opportunity to Counter with Opportunity Fire or similar. Rather than forcing that issue right now, the Tani player decides to work his Gilli and see how things play out. The Gilli group initiates a melee attack on Thardson. Rogue Planet allows a defender (in a melee) to either 'normally' counter-attack else Fight Defensively. As Thardson's CQ is less than his DEF, he's better at fighting defensively. Thardson decides to defend with the hope of buying some time for the Squad and maybe receiving some support in return. By the way, it's worth noting that there aren't any Counter-Actions that can be activated by the initiation of melee. Spying Stonnet's dash around the corner, Thardson valiantly fends off the vicious Gilli's strikes, buying the Captain an opportunity to join the fray. "Hold fast Trooper," booms Stonnet, "Hold Fast!" 🎲The Gilli activate a second time (Activation Points from 5 to 4) and continue their attack; however, Thardson is now benefited by Captain Stonnet's support, bolstering his defence. Thardson defence is for naught however as the Gilli roll a double 6, resulting in another Total Success. Rolling a double also is treated as a Critical Strike, which, in this particular instance, means that Energy cannot be used to negate the damage - Thardson finally succumbs to the onslaught! Being a Total Success, the Human's aren't awarded a free reactive move either, which could be telling. "Aarrgghhh!" screams Thardson, crumpling to the ground as his blood pools around him. The Gilli, being non-Heroes/Leaders, can only be activated twice consecutively, so now the Tani player need make some important choices. With 3 Activation Points remaining, in order to activate the Gilli again, the Quarra must be first re-activated, however that will almost certainly provide the Humans with an opportunity to perform a counter action. Going into overdrive, the Quarra runs through a deadly hail of fire and charges Grezal, bowling his lifeless corpse into the Sapporo Factory's alley. Then, without missing a beat, the Quarra swings to the South-west and joins the Gilli in their ensuring battle with Captain Stonnet. The above sounds pretty straight-forward but a fair amount of happened in the background and the sequence of events could have played out quite differently. The Quarra declares a Charge on Grezal (1 Action Point) to which Grezal declares an Op Fire Counter-Action (at a cost of 1 Human Action Point). 🎲Grezal's counter fire ends up being ineffective and the Quarra's Charge results in a Partial Success. 🎲Grezal and the Quarra's collision is resolved with 3 points of damage is dished out to Grazel and he's sent sprawling into the alley from which he had just emerged - three points of damage is beyond the Human's available Energy Pool so it's goodbye Grezal. All was not in vain as the Partial Success provides the Humans with an additional movement. Grezal dying gasps over the battle channel alert Matte to the situation - the Quarra hasn't been stopped. Instinct takes over and Matte joins in the melee with his Captain, in a desperate attempt to turn the Tani's tide of destruction. 🎲The Tani then orders the Gilli to attack Matte (1 Action Point). Matte opts for a defensive melee and the Gilli's Skill Check results in a Critical Partial Success. Without the ability to use Energy to offset the Critical damage, Matte is eliminated. The Human's free Move is essentially wasted given that there's now no 'free' Humans i.e. they're all presently engaged in melee. 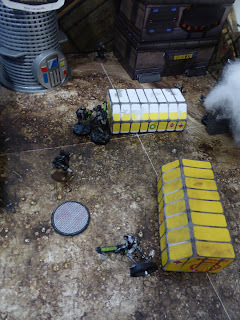 But it is for nought as Matte is struck down by the rampaging Gilli warriors! Finally, the Quarra closes in on Captain Stonnet (1 Action Point) and strikes at him with its huge bayonet axe (1 Action Point). The Human player foregoes a defensive stance and takes the xeno face-to-face. 🎲The melee attack is resolved to take into account each parties relative CQ rating, their gear and supporting Units (e.g., the Tani Gilli). And the result: somehow Captain Sonnet turns the tables, inflicts a point of damage onto the Quarra and the Human's are awarded another free (but unfortunately wasted) move. The Quarra's huge blow is parried by Captain Stonnet, who fires his Melta Pistol back at the abomination. Unbelievably the Quarra holds it's ground. 🗲 By using the last of the Tani's Energy Pool, the damage to the Quarra is yet again nullified. With the Tani's Action Points all used, the Turn now switches to the Humans, who've been reduced to a single Unit with only a single Action Point remaining. There's little to be gained (and a lot to be lost) by attempting to disengage from a melee, so Stonnet attacks the Quarra (1 Action Point), intending to end the fight once-and-for-all! A standard melee is resolved with the Quarra foregoing defensive combat. The modifiers are slightly in Stonnet's favour: his Power Sword and Pistol are partially offset by the Tani Gilli supporting the Quarra. Importantly the Power Sword also provides it's wielder a Rogue Die on the attack and it's treated as Armour Piercing, reducing the protection otherwise afforded by the Quarra's Medium Armour. 🎲Captain Stonnet rolls a modified Partial Success. A Partial Success would normally result in a single point of damage against the Quarra - and the Tani being without any Energy left, that would be that! However, there's more to this story: the Power Sword's Rogue Die. The Rogue Die is rolled along with the Skill Check and should it match any of the natural die, the Rogue Die's result is added to the damage total. Guess what? Stonnet got a matching 3 on the Skill Check's Rogue Die - that's a massive amount of damage! Talk about overkill! With a ground-shaking cry, Captain Stonnet slashes his Power Sword down, rending the Tani Quarra in two. Seeing their leader slain, the remaining Gilli take heel and flee! "Command, Stonnet reporting: my squad fought valiantly and the Tani have been routed. Send in the medi-vac and another team to the Southern Sector. Stonnet out." Wow, what a blast! There are so many twists to Rogue Planet's rules that it's hard to know where to start. Could the Tani have bested the Humans? Most certainly - some slightly different tactics, a couple of different rolls and it was anyone's game. Whilst the above battle report only has two Turns described, games where there are more Turns become very tactically challenging. Just making the choice between rolling a d6 or going with the default 3 Action Points can be very stressful, especially if the preceding Turns had you playing second fiddle to your opponent. Then deciding if and when to try counter-actions and the management of your Energy Pool... argghhh! but in a good way. One thing that wasn't really apparent until we played the Rogue Planet was the impact of Skill Check Failures. For example, failing to connect a close combat attack can result in the initiator being killed while a failed ranged attack could award your opponent with two free moves. A couple of poor attacks in a row and you can quickly find yourself on the defensive. The universal Skill Check mechanism is very easy to get the hang of, and despite my aversion to modifiers, Brett's struck a balance that actually works for me. We've quickly found ourselves assessing and applying the modifiers without drama - we weren't wasting time hunting tables etc in Rogue Planet which is always a plus in my book. Also, a plus is the lack of markers and record keeping: Given a Unit can effectively activate an unlimited number of times and damage is so cut-throat, there's a welcome absence of markers on the board. I think we've found a contender for the #1 set of rules in these parts. The system's quickly understood, flexible and filled with opportunities for drama all while providing a satisfying tactical palette for those inclined in that way (read those of us over the age of 8!). Already there's discussion as to what shape our next game will take - that's always a good measure of a game's worth in my book. Good to finally see a Rogue Planet game. I've only played the game solo and found it a great change of pace compared to usual wargames. I like your style of reporting, where you switch between the narrative and rules. Explaining everything on the go. Nicely done, I look forward to see more of these. Thanks! This is something a bit new for me and to hear that someone else finds the output enjoyable makes the effort all the more worthwhile. I'm open to suggestions as to what next, let me know what tickles your fancy and I'll see what I can do. Great battle report! I'm going to play my first game pretty soon, can't wait. The rules look really cool. Make sure you tell me about it! Also it has taken me half a dozen games to get a sense of how you can/should? approach play. Don't be too hard on yourself, especially if you're used to something like W40k - the whole activation, counter mechanism alone is vastly different (in a good way) from what most gamers would be used to. Looks good. Can you use it to play Warhammer? Do you mean play a miniature's game based in the Warhammer Fantasy, Warhammer Age of Sigmar (AoS) or Warhammer 40,000 setting? The answer's Yes, Yes and Yes. It is a different experience but not necessarily any better or worse - like most things in life it comes down to personal preferences. As I play Rogue Planet more, I'm become more appreciative of how the game's mechanics combine to deliver something very elegant... more elegant than many other games. The differences in the game take some getting used to, especially the no measured movements, but ultimately I think it's a fantastic set of skirmishing sandbox rules. A very enjoyable read! I'm really intrigued by these game mechanics and really want to give them a go. Awesome! I recommend you do just that. FYI more recently I have been playing with changes to the Turn Action defaults (upping them to 4) and Skill Check related Actions - I recommend that you give them a read (more recent entries in my blog) .